"These tasty snacks are easy to double and the guys just love them." Wrap 1/2 slice of bacon around each piece of hot dog. Secure the bacon with a toothpick. Place hot dogs into a slow cooker on low heat. Pour brown sugar over hot dogs, let cook for 5 to 6 hours; until the bacon is cooked. I've made these at many a get-together & they are always a hit. For faster cooking, I bake them in the oven for an hour at 375 degrees. YUM! You can use cocktail weiners for this recipe and broil them on a cookie sheet for 5 minutes and they turn out great. This was easy to make and very good. My husband thought I was crazy making it, but he loved the end result. I did hand roll each one in the brown sugar. Mine didn't take very long to bake. 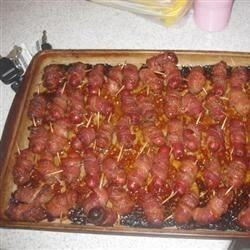 my sister in law gave me a recipe similar to this, but with little smokies. to make it quicker, bake till bacon is done. very yummy.